The bottle brush has really interesting blooms. 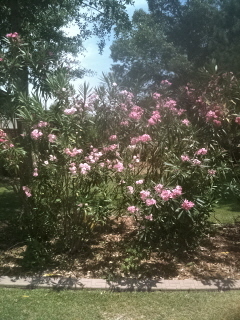 Oleander blooms are plentiful and last about three times longer than azalea blooms. The downside is that frost can cause damage and they are considered poisonous. In the backyard, everything is blooming! I have about ten CINNAMON RUFFLE dwarf crape myrtles. They're beautiful! Confederate Roses are one of the great Southern gardening traditions. Crape Myrtles and orange and yellow Canna Lillies are in full bloom. 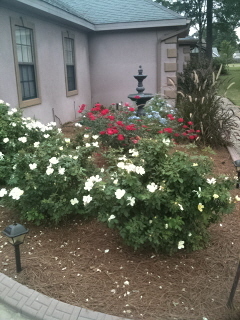 and blue Plumbago add lots of color up in front of the house. Purple Lantana bloom much later and lasts until frost gets to them. Camera Lantana blooms and blooms and attracts butterflies during the Summer. Take lots of pictures when your flowers bloom. Happy Gardening!